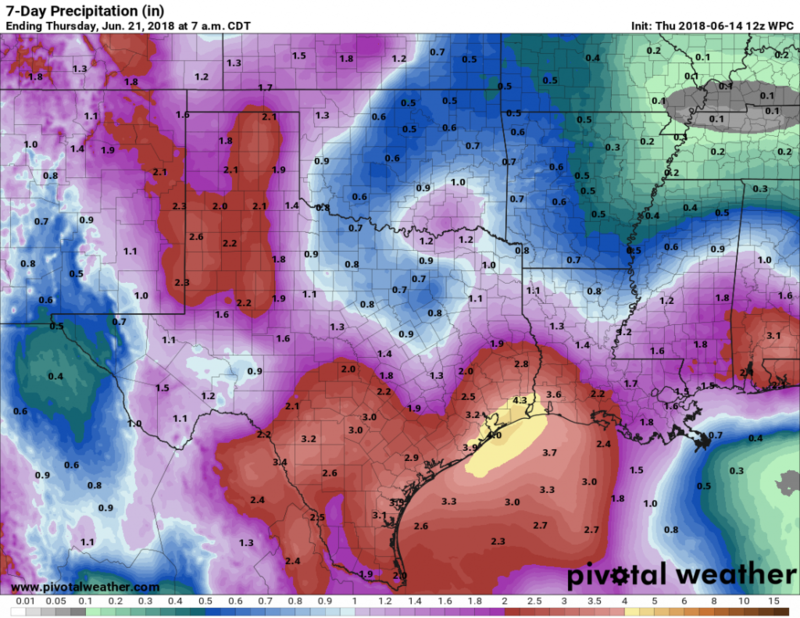 Cooler and significantly wetter weather remains on tap for the weekend—at this point Sunday looks like the wettest day—but with a disorganized tropical system moving into Mexico we don’t see any signal yet for widespread, significant flooding. So we’re watchful, but not overly concerned at this point. If you’ve been following along with Matt’s updates this week, you pretty much know what to expect. Houston endured highs of 97 degrees on Tuesday and Wednesday of this week, and that trend should pretty much continue to end the work week. Warm days will be punctuated with isolated to scattered showers, some of which can be intense as we saw with some storms near Tomball on Wednesday evening. But for the most part, conditions will just be hot and partly to mostly sunny. 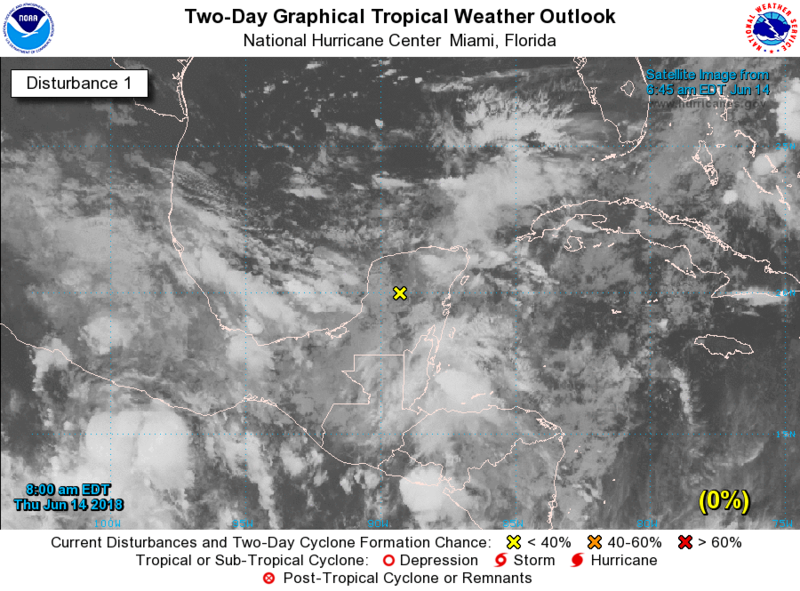 We continue to think the tropical disturbance now moving over the Yucatan Peninsula, which will move westward into the Bay of Campeche and likely into northern Mexico, will not develop. That means that the primary threat from the system remains tropical moisture, which should spread into Texas this weekend. The key question is where the greatest amount of moisture will surge inland, and unfortunately we can’t say this with any precision. 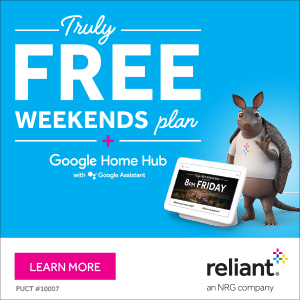 Will it be Houston? Beaumont? Victoria? We just can’t tell you yet. With that in mind, here’s our best stab at forecast conditions for this weekend. If you’ve got outdoor plans on Saturday, especially if you live in inland areas, conditions probably aren’t going to be a total washout. Coastal areas are very likely to see some moderate rainfall, but areas north of Interstate 10 are probably 50-50 on whether they see rain Saturday. In other words, have a back-up plan for any outdoor activities, but don’t write them off just yet. Highs should be about 90 degrees under partly sunny skies. These are the peak days for rainfall as moisture surges into the Texas coast. Forecast models generally indicate widespread totals of 2 to 4 inches of rainfall, with pockets of 5 to 9 inches of rainfall. Where will these higher totals occur? Alas, we simply don’t have the precision to say at this vantage point, and probably won’t until Friday or Saturday at least. What we can say is that there is definitely the potential for some flash flooding this weekend—which you should keep in mind for travel plans on Sunday and Monday as streets may flood for a short period of time—but right now we don’t see much of a threat for flooding homes. (We’ll be here every step of the way this weekend, so as the forecast changes, we’ll let you know what we know). Highs should only rise into the mid- to upper-80s. Rain chances remain into the middle of the next week, but as the surge of moisture ebbs, so does our concern for the potential of prolonged, heavy rainfall. Do you think there will be widespread thunderstorms on Sunday that may cause flight cancellations at IAH? Worried about that too my wife is supposed to fly out Sunday evening. Informed but not unnecessarily alarmed. Thanks. Have a Happy Father’s Day. Thanks! Leaving out of Hobby on Monday morning, and hoping that we can get there. Starting with getting out of our Westbury neighborhood! Man, this heat blows. It’s “only” 14 June. It’s ridiculous, even at 8AM this morning. A little rain (not too much) this weekend will at least cool things down. This was the forecast for Harvey rainfall two days before it started, and enough, 20+” was forecasted. I remember thinking “no way”, but as we all found out, it was almost spot on (almost because it was UNDER forecasted). We tend to think that we were not warned and didn’t know what was coming, but we actually were. If this forecast is 2-4″, then I trust it. Hoping it comes to NW area. We need it bad. Do you remember that scene In Back to the Future II in 2015 with the pouring rain? Doc looks at his watch and perfectly times when the rain would stop and says “Right on the tick. Too bad the Post Office isn’t as efficient as the weather service”. I guess they got that prediction wrong, but it sure would be nice. As Eric Clapton once sang, “Let It Rain”! Thanks for the updates. We’re supposed to have my son’s bday party at the park in Deer Park Saturday morning. Following y’all every day and hoping we can squeeze in his party before the rain hits! Thoughts? Party should end before noon. We got a twelfth of an inch here in the Greater Heights. It seemed like more and was especially welcome ahead of what’s coming tomorrow. Paul Robison, I believe the answer to your question is “low”. Your question indicates concern about the rain causing trees to topple. The max predicted 9″ is highly unlikely to do that with most trees. The highest wind forecast I see on WU’s graphs are less than 20 mph. There may be some power outages, and it might happen at your house or at mine, but not likely to be widespread. Take a deep breath, hold it for a count of 5, let it out. Repeat. Relax.